Question: What is the big deal about uniforms and why should I care? Answer: There are a many reasons. When you join CAP, you take an oath to wear the uniform properly. The Air Force prescribes the way that we wear "their" uniform and accessories. If CAP members fail to wear the uniforms properly, this shows disrespect for the uniform and reflects badly on CAP and the Air Force. This is unacceptable for a CAP member. Proper uniform wear shows self-discipline, develops teamwork, and develops a sense of "Esprit de Corps". "Esprit de Corps" is that level of morale and sense of pride that comes from being part of unit or organization that excels. Question: Can I wear my CAP Uniform to School? Answer: No, except for special situations authorized by CAP. CAP Uniforms are not to be worn except for CAP meetings and approved activities. Question: Are there any restrictions about wearing jewelry or body piercing when wearing a CAP Uniform? Answer: Yes! See the Dress and Appearance Standards for CAP Members - Quick Reference in the links on this page or refer to CAP Manual 39-1, Civil Air Patrol Uniform Manual link on this page. Question: Where do I find information about haircuts and hairstyles that are appropriate when wearing the uniform? Question: I am going shopping with my family and my parents are going to drop me off at the CAP meeting on their way home. Is it OK to wear the uniform while we go shopping? Answer: Not a good plan! CAP uniforms should only be worn for up to one hour before or after meetings/activities, unless travel time to/from meetings/activities is longer than an hour. Make arrangements to change into your uniform when you arrive at the meeting and arrive early enough to do it before the meeting starts. Question: I am on my way to the weekly CAP meeting. Is it OK to stop by Subway, McDonald's, etc., to eat a quick meal? Answer: Yes, this is probably OK. A quick and necessary stop is acceptable. Just be certain that you are wearing a COMPLETE uniform when you go into the restaurant. By the way, a fast food restaurant stop is OK; a two hour sit-down dinner is not appropriate if you are in uniform. See the answer to the previous question. Question: It's the fourth Monday and we are scheduled to do PT Testing, so I'm wearing my athletic shoes with my BDUs. On my way to the meeting is it still OK to stop by McDonald's for dinner? Answer: NO! Not this time, unless you do not get out of the car. Without combat boots, you are NOT in a full uniform and should not be in public out of proper uniform. Think about the impression you will make on others. Anyone that sees you only sees a cadet out of uniform and there is no excuse for that. Have enough pride while wearing the uniform to avoid this type of situation. Don't try to get away with hoping no one notices. To avoid this situation, wear your combat boots to the meeting and change into athletic shoes when you get there. Question: I like wearing BDUs but I don't like blues. Is it OK to wear BDUs to all meetings? Answer: This has actually come up before. No, it is not OK! Cadets are required to wear the Uniform of the Day (UOD) if they have that uniform. The blues uniform is issued for free; every cadet should order this as soon as possible after joining. Although CAP does not require cadets to purchase BDU uniforms, the blues uniform is simply not appropriate for some activities. Cadets are strongly encouraged to purchase BDU uniforms so that they can participate in all activities. If you have both uniforms, wear the correct uniform. Question: Is it OK to wear only part of my CAP uniform? Answer: When in public, NO! Wear all or none. At meetings and activities, the commander may allow some exceptions. Question: When wearing my blues uniform, what should I do with my flight cap when I go indoors? Answer: Regulations state that the flight should be tucked into the belt in the front right or front left. Evergreen squadron policy is to wear the belt on the front left. If you take off your flight cap, always, always, always tuck it into you belt. You are not likely to forget and leave it somewhere if it is tucked into your belt. Question: Do I always have to wear my ribbons? Answer: No, but you probably should unless there is a good reason not to. Be proud of your accomplishments. Regulations state that cadets should wear either all of their ribbons or none of their ribbons. For the Service Dress Coat, ribbons are required. If you decide not to wear ribbons on your blues shirt, after removing the ribbons, spray the area lightly with water and press the area to get rid of the pinholes. Those holes draw attention like a magnet. DON'T wear a shirt with pinholes; they look terrible! Question: Where do I find more information about uniform and accessory wear? Answer: The CAP Manual covering uniforms is CAP Manual 39-1, Civil Air Patrol Uniform Manual. Compliance with this manual is mandatory for all members. You can access this manual at the CAP National Headquarters website. A like to the manual is available on this page and on the Useful Links page of the squadron website. 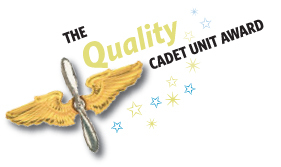 There is also a link to a squadron document titled, Dress and Appearance Standards for CAP Members that you can find on this page and the Useful Links page of the squadron website.